Each year I tour North America during the Month of Adar, because this month is most favorable for success. Thanks to Hashem and all our great friends and supporters, I have returned home to Midreshet B’erot Bat Ayin with almost enough blessings to keep us sustained for the entire year. I undertake my annual journey with emunah that Hashem will smile at B’erot, as I share my Torah and myself with all of you who will meet me or hear me speak. Adar is the month of good fortune. “Just like when Av enters we decrease in happiness, likewise when Adar enters we increase in joy” (Babylonian Talmud, Ta’anit 29a). On Adar the Mazal (fortune) is strong to give them hope for a good end (Ibid.). Adar is known to be the month of success and victory. During Adar spring is in the air, battling the remnant of the long dark winter month of Tevet and Shevat. 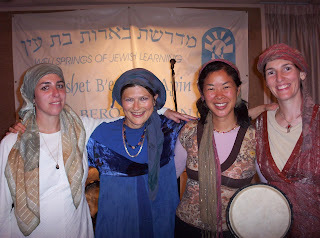 The name Adar is connected to the Hebrew word Adir (Tehillim 8:2) meaning empowerment and strength (Machshevet Charotz, Chapter 4). The word Adar can be broken into A/Dar -the Hebrew letter “alef” representing the oneness of G-d dwells (in Hebrew “dar”). G-d created the world “to make for Himself a dwelling place (dira) in the lower worlds. Adar represents the lowest of the worlds, but it is specifically here where G-d, the alef, longs to reveal His presence and to dwell. Since Nissan, the month of Passover, is considered the first of the Jewish months (Shemot 12:2), Adar, being the culmination of the Jewish year, gives us the opportunity to tie all the loose, hanging ends, and turn all possibilities of frustration and depression into joy. The phrase “Completely turn around” (Megillat Esther 9:1), is the main key to connect with the energy of Adar, where we have the opportunity to transform our very lowest shadowy sides. Just as the fish are covered by water and the evil eye cannot rule over them, similarly we are protected from the enemy (Rashi, Bereishit 48:16). Pisces is opportune for both physical and spiritual blessing; one fish represents physical wholeness, the other fish represents the eternal soul. The Divine soul grows and develops through the twelve constellations of the zodiac; we reach our ultimate perfection in the last constellation of Pisces. “…They nurture him with pure water from Aquarius (in Hebrew water-container) and he grows with great joy like a fish which enjoys being in the water…He perpetually eats from the Tree of Life which is planted in the section of the righteous… and he lives forever”(Midrash Tanchuma, Ha’azinu 1). Just as fish live in the hidden world of the sea, the Divine souls swim in the waters of Torah; our true identity being invisible in this world. Fish- in Hebrew “dag” represents the “tikkun” (rectification) of da’ag –“to worry.” The strong (though initially hidden) mazal (fortune) of Adar, converts all our worries to ultimate joy of redemption and rebirth. The two fish of Pisces represent Yosef’s two sons who were blessed by Ya’avov “To increase fishlike within the land” (Beresishit 48:16). One of the definitions of Purim, the Jewish holiday celebrated in Adar, comes from the word pru – “Be fruitful and multiply.” Therefore, this is the month most suited for pregnancy and birth (Resisei Layla, 58). Pisces is a water sign. For the sake of the purity and repentance associated with water, the Jews were saved at the time of Purim. Just as fish cannot live without water, so the world cannot exist without Torah. The Torah is compared to water, because you need to be humble to absorb it. Water always flows downward, seeking the lowest level. Moshe, the giver of the Torah, was the most humble of all men (Bemidbar12:3). He is closely linked to water and his name means, “From the water I have drawn him.” (Shemot 2:10). Moshe was born and died on the 7th of Adar! The two fishes represent the Written and the Oral Torah, given during the constellation of the twins of Gemini. Since the spiritual power of the Jews climaxes in Adar, the process of the giving of the Torah was actually not completed until Purim. Only then did the Jewish people accept the authority of the Sages and their Oral Torah willingly (Babylonian Talmud, Shavuot 39a), when the sage Mordechai with the help of Queen Esther brought about the salvation of the Jewish people. For the Jews there was light and happiness” – Light refers to the Oral Torah (Babylonian Talmud, Megillah 16b). According to Kabbalah the Oral Torah is considered female because it receives from the written Torah. The power of the female is to build, complete, and create wholeness, as the woman takes a tiny seed and builds it into a complete being within her. The Piscean personality is very flexible and can easily adapt to change. Since Pisces is the last of the Jewish Zodiac and represents the highest stage of development, the Piscean personality is able to associate with various types of people, and has the power to bring about self transformation. “Glory and Majesty is her clothing and she laughs to the very last day” (Mishlei 31:25). Adar is bubbling over with laughter, as the last month of the year, and the feeling of having reached completeness causes joy. Laughter is the expression of unbounded happiness, resulting from witnessing the light of the Purim miracle emerge from darkness – “The advantage of light from darkness” (Kohelet 2:13). Laughter, Joy, Happiness breaks all borders; this month is the time to take advantage of this window of opportunity and increase in joy and happiness. “The spleen laughs” (Babylonian Talmud, Berachot 51b). At first sight, this appears most paradoxical, for the spleen is considered the seat of the black humor, the source of depression and despair. Yet, all of the phenomena of Adar and Purim are essentially paradoxical, and represent states of existential metamorphosis. The spleen is connected to the immune system. Its purpose is to fight against infection of evil invaders. Laughter is an expression of overcoming evil. Strengthening our will power gives us the ability to overcome evil, and achieving completeness. Reaching this peak of wholeness through our own efforts is what engenders the greatest possible happiness (Rav Yitzchak Ginsburgh). “Then our mouths will be filled with laughter” (Tehillim 126:2), the ultimate expression of happiness without bounds. G-d’s dwelling place below, brought about by our descent to transform all depression and sadness to pure delight. The letter kuf begins both the words kedusha, (holiness), and klipah, (shell). The spiritual work during Adar is the ongoing work of extracting sparks of holiness from their impure shells and transforming them into holiness. Therefore, the month of Adar receives the power to conquer and elevate our base desires. The month of Adar marks the end of the six winter months, and corresponds to Elul, the sixth of summer months. This is mirrored in the letters that form the nature of these signs; Adar was formed by the kuf, whose numerical value is 100, while Elul was formed by the yud whose numerical value is 10. Each represents completeness in their domain. The letter kuf also means “monkey” (kof). In accordance with the idiom “as a monkey in the face of man,” the kuf symbolizes the custom of masquerading on Purim. Before the miracle of Purim, G-d Himself “hid His face” and His name is not mentioned even once in the book of Esther. By initially hiding our identity, pretending to be someone else, our innermost essence becomes revealed. This also explains the concept of modesty by concealing our body we reveal our soul. Before eating from the Tree of Knowledge our bodies were so refined and transparent that they reflected the light of our souls. Afterwards the body became a mask for the soul, concealing our true inner being. The purpose of garments is to conceal the mask of our body and through the choice of texture, style and color, express our inner essence and bring forth hidden sparks of our soul. During Adar we complete the book of redemption, Shemot, (Exodus) by reading the Torah portions of Truma, Tetzave, Kitisa and Vayakhel & Pekudei. These Torah portions mainly describe the completion of the mishkan (tabernacle) which is the underlying theme of the holiday of Purim. The evil Queen Vashti refused to allow that King Achasverus give permission to rebuild the Temple in Jerusalem. The true victory of Purim took place when Darius, the son of Queen Esther began to rebuild the holy Temple. During a regular non-leap year, we read the Torah portion Tetzave about the clothing of the Cohen Gadol, (High Priest) the Shabbat prior to the holiday of Purim. The purpose of these exquisite garments was to cover the mask of our body and return the original light of Adam the first man. Amazing!! What a fantastic post! Can't wait to read more!